After reading whole studio assignment write-ups, I could see the development over this semester. All the new materials and machines were quite difficult to me in the beginning of the semester. I took a video of the process of using machines and programs. After I attended to the discussion session, I came to the fab lab almost everyday not to forget what I learned. From the laser name tag assignment to final proposal, all of my write-ups are focused on reflection part. 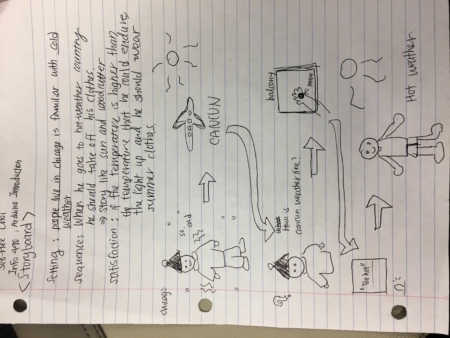 Instead of writing what I made, I wrote what is the process and how did I overcome challenges. Even though there were some difficult tasks like arduino or coding stuff, I enjoyed the process of making. I made a toy set for kids. The theme of the toy is Harry Potter Magic World. 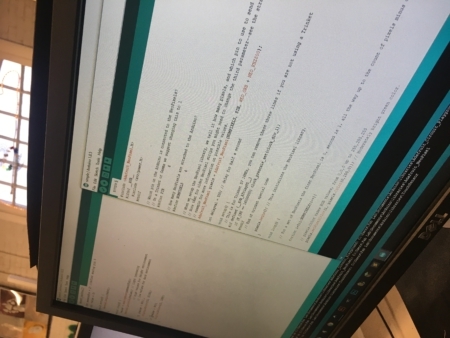 Since I am not a Computer science major, I had difficulties with coding the Arduino. 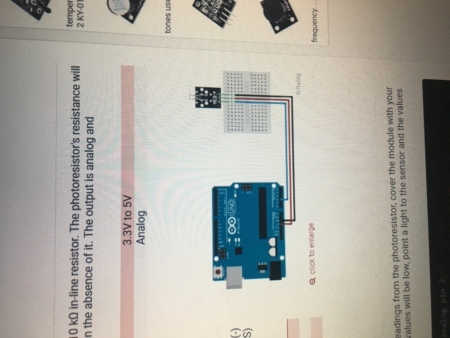 My final goal of Arduino part is to make the light on when the sensor detects the Blue or green light: Harry Potter’s color of magic light is blue. Despite of less knowledge, I finally figured out how to code to make the LEDs turn on when the sensor detects the blue light. I also change the code to turn on the deep pink instead of green color. I also used the different type of LED instead of light bulb LED since its light was too weak that I could not see in the dark. For the Harry Potter box, I used the wood shop tool to make a hole. Before I took this course, I really interested in 3D printing. I thought it is wonderful to create what I imagine. Not only making what we want, but also it is useful in lots of fields. My mother is a dentist and she told me about how 3d printing is also used for implant surgery. I wanted to work comfortable with 3D modeling. So, my first goal was to create my own design instead of using the design which is also made by others. Since I used the battery holder in the fab lab, I had to redesign the wand to insert different type of battery and battery holder. I calculate the size and length of battery holder, wire, and LED. 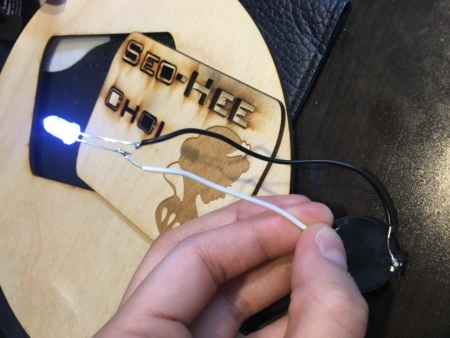 I created the hole inside the wand so that I can insert the LED and the wire. It took a long time to design the wand. 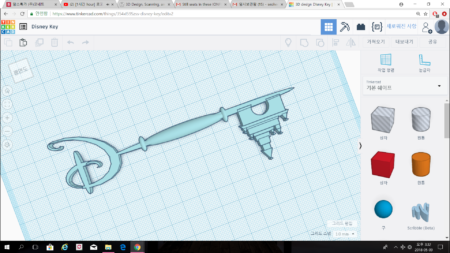 I used the scanner to design the outside of the wand and then I used Thinkercad to make a hole inside the wand to insert the battery holder. My second learning goal is to be comfortable with Arduino and coding. 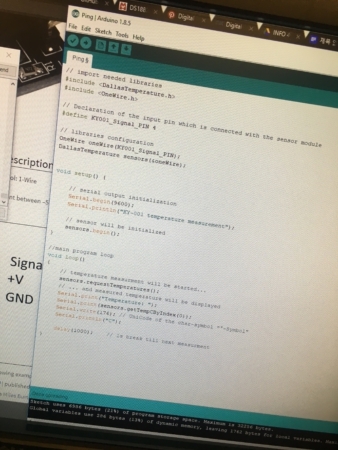 When I took first class of introduction to Arduino, I had hard time catching up the class materials. I thought Arduino is the one which is most useful in the daily lives. It was easy to find how to connect the sensor with the breadboard. However, I had to code to make the pink LED turns on when the sensor detects the sensor. I looked through the examples of other codes. The first trial of coding was kind of failure. In the middle of whole classmates who are majoring in CS, I had to struggle with coding the system that I want. After wrapping up INFO 490 this semester, I could say that I am a maker. Seymour Papert’s constructionism is exactly made during this course. His constructionism is that knowledge is something a person build in his head. During the whole semester working for the various projects in Fab lab, I am more comfortable with imagining creatively and envision it: to build something tangible, “something outside your head”. In the beginning of the semester, “maker” is the definition of just producing the results. However, the “maker” to me is more focusing on how I can envision what I thought. During the process of thinking about the final project, I wanted to re-do the 3D printing about the Disney stuff. For the 3D printing assignment, I tried to use scanner to produce of artifacts. 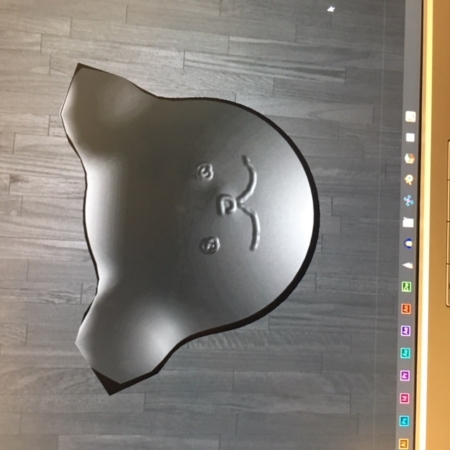 In the Tinkercad, I could not make the exact shape of Disney logo. 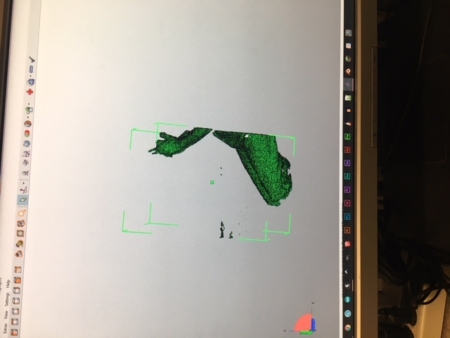 I used my Disney toy to scan its shape. Instead of using exact same castle shape, I just added the squares and triangles. For re-do assignments, I also used soldering to use LED. The first trial of this artifact was failed because of too much supports and brim. Instead of building support, I removed it and just used the brim to hold the structure. After I printed out the 3d model of my prompt, I really wanted to work on the 3d printing model which I really need and want. 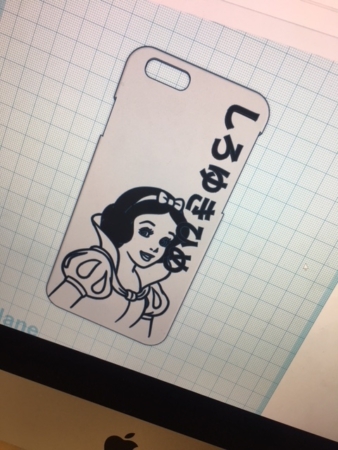 I started to edit the phone case model. Instead of using the Snow White design for iPhone 6, I searched the dinosaur character and add more design. For iPhone 7 model, I added the character which my friend like. 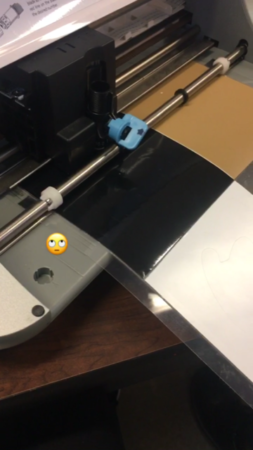 Since I wanted to use two different colors for the phone case design, I asked the makerlab TA for using dual color printer. However, there are mass orders, so I could not use the dual printer. At first, I tried to print separately and stick small pieces together as I did in tacoyaki prompt model. However, the design of phone case was so complicated to stick tiny pieces together. So, TA and I planned to pause the printer and change the color when it start to print new layer. There are also problem in this plan. 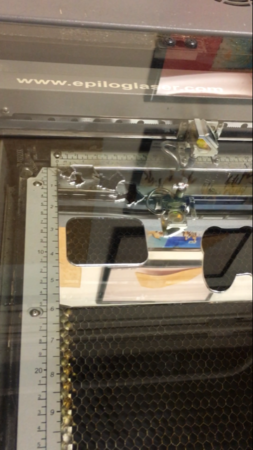 When I print the phone case separately, I did not need to worry about the support which would be created in the hole in the middle of phone case; the printer started printing of phone case from the bottom part. However, when I printed from the back side of the phone case which has the pop-up layer design, then there will be the support inside the hole in the other side of phone case. 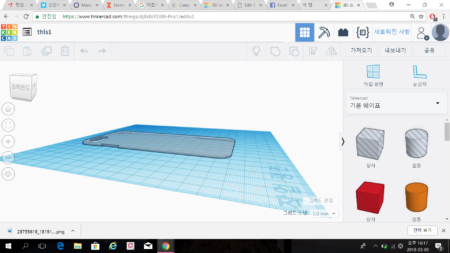 What I planned to do was cut the partial bottom part of the phone case so that there the printer will only print out the little bit of upper layer and all of the pop-up design layer. Then I plan to print the other remained bottom part which I cut. Even though the project I chose to iterate was name tag assignment, I redid the 3D printing for decoration. The thesis of the assignment is Disney character. In the name tag, I inserted the silhouette of Snow White instead of a pig. 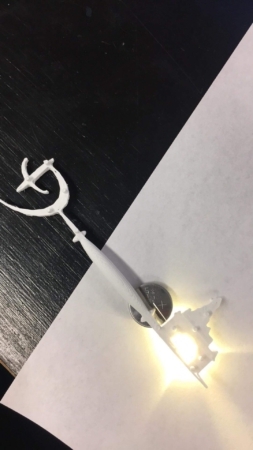 For 3D printing, I printed out the Olaf. When I printed out the olaf, it almost failed. Olaf has nose and tiny arms which caused a lot of supports. When I took off all supports, the arm was removed with supports. 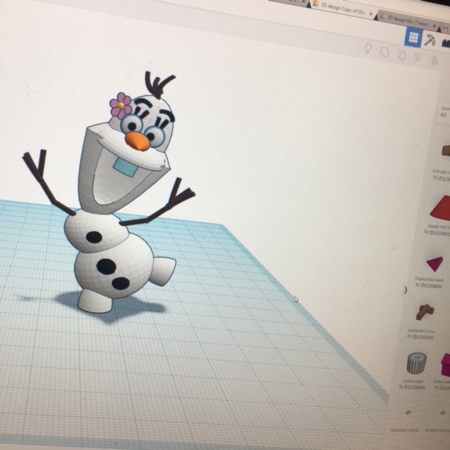 So, I tried to work in makerlab and redesigned the olaf; I just made a new snow man. My snow man had thick arm which might not cause the support. Also, the new snow man did not have tiny details like eyebrows or flowers. 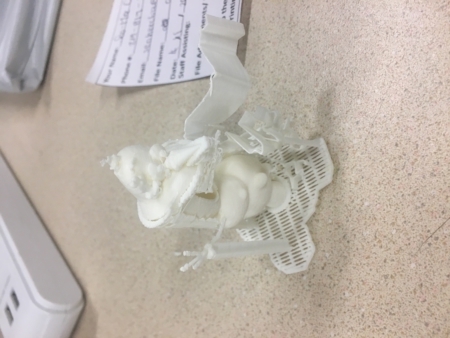 When I printed out the second snow man, it still had supports. TA told me that I should make design thicker so that the tiny parts will not removed with supports. For the name tag, I worked with the wood. The reason I chose the wood was because I like the mood of the wood. The original design I built up was Olaf holding my name tag. I thought the wood would be better to use instead of other materials. At the first trial, ”S”, “C”, and “O” was not printed. I repeated the same process as what I did for the original assignment. During the process of working with Inkscape, there was no problem with the design. After I saved as pdf file and opened the file, there were some missing letters. 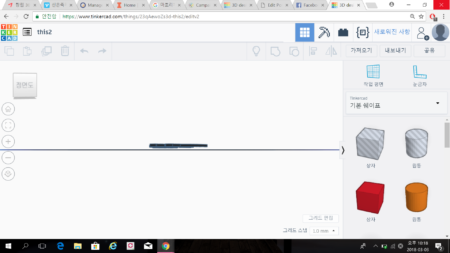 When I asked one of my classmate, he said that it does not matter with what pdf file shows. So, I printed it and the laser cutter just printed out what is shown in pdf file. I removed the file and remade it. I did not know what is the problem but when I redid it, all the letters were not missing. I made two name tags for first assignment. First one is made by wood and second one is made by mirror-type acrylic. Mirror-type acrylic has two layers. How do you plan to approach your physical and/or software redesign? What challenges or failures did you encounter with your initial physical design (e.g. materials, locomotion) and/or initial code? What are you going to try to improve about your design? Do you plan on changing any of your materials? At first I want to make Elmo pom-pom bot which moves up and down (Elmo popping up from the trash can). However, the main goal of this assignment was to make the pom-pom bot move forward with horizontal movement, not vertical movement. 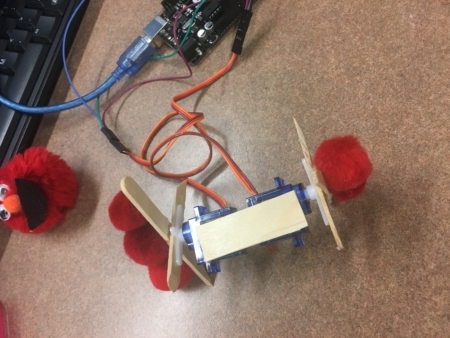 I first designed to make my pom-pom bot both move up and down and forward. When I first thought of vertical movement, I was curious how could I make the pom-pom bot up and down with motor of moving 180 degrees. I got help from my TA. For up and down movement, I planned to use push rod and cam shaft. 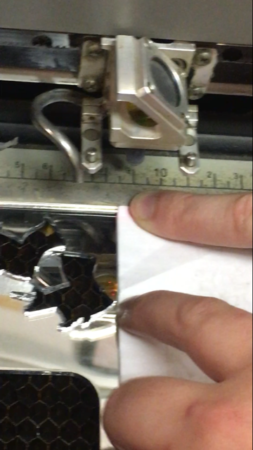 The time was limited and when I tried with the paper folding instructions, its was difficult to stick servos with paper. To be honest, taking process of coding two directional movements was quite difficult to me. I changed the design of my pom-pom bot. Did your update(s) to your initial design work? Discuss why you believe your design updates were successful or not. Did you encounter any new challenges or failures with the physical design (e.g. materials, locomotion) and/or code? My second design was totally different from my initial prototype. I thought the second design might work because there was only one movement. 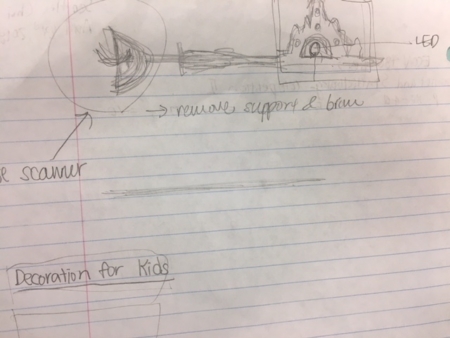 What I thought was how should I make this pom-pom bot move forward. When I worked with this servo, it was at a standstill. So the first thing I did for making it forward is to differentiate the move of two servos. I made the second servo to delay 10 seconds. The first servo was more power when it moves. 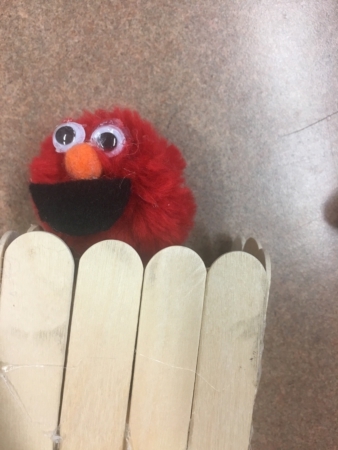 Then, I sticked the wood to the servo to make a leg of Elmo. I thought it would move forward if there is something encumber like wheels. I had a thought of wagon wheel. Then, I thought if there is one more wood stick and the shape of wood connected to servo is X, the pom-pom bot might go ahead. Before I connected the servo with my pom-pom bot, I thought it is better to make the servo-connected wood as arms instead of legs. 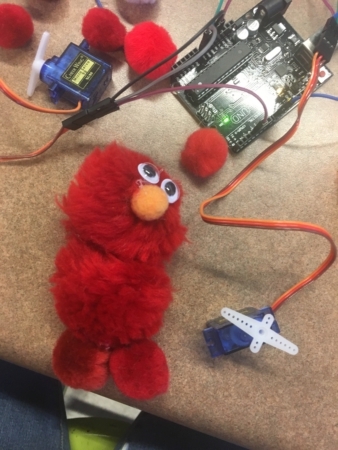 When I connected all together, it seemed like Elmo was swimming the backstroke. Was there anything about this design process that was new or surprising to you? How would you approach a similar problem differently in the future based on this experience? My first design and final product are different. The main purpose of the pom-pom bot is different. If I had more time I would work more on the first design. I wanted to make cute pop up Elmo trash can first. 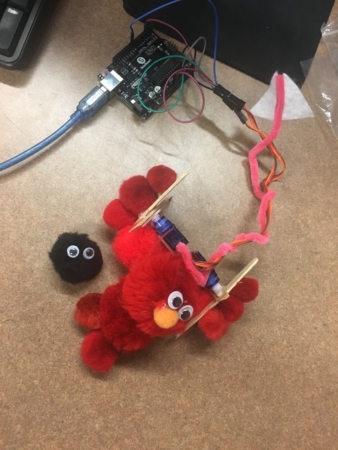 However, my final Elmo has also storyline; my final pom-pom bot looks like red Elmo which has quite big and long arms trying to reach to the black cute dust. During the process of completing this assignment, I thought lot. I should make my pom-pom bot to move forward. This specific purpose made me think a lot. What will make my pom-pom bot to go ahead instead of staying in the same spot. Finally I made my Elmo to get closer to black dust! If there is difficult task, I should think a lot. I first tried to understand what is the problem. Why the servo just stay in the same place? Second step was thinking other subjects which works in this same situation. If the shape of the servo is circle like a wheel, then it will go forward? Then, design with implementation. For this assignment, I was so confused and nervous. 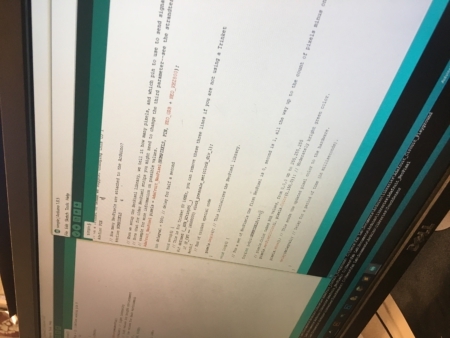 Unlike other classmates who are majoring in computer science, I had never used coding before. At the discussion section, TA helped me with doing class activities. Since I was not familiar with coding and arduino, I just worked with one sensor: distance-calculating sensor. When I saw the material box prepared for us, there were various sensors. Before the spring break, I did not have specific idea of which sensor I should use. During the spring break, I went to Cancun which has totally different temperature of Chicago. I thought it would be nice to use temperature sensor. To be honest, there were more worries than the excitement. Even though I have guideline to use Arduino and sensors, I thought it would be difficult to code what I want to have as a result. 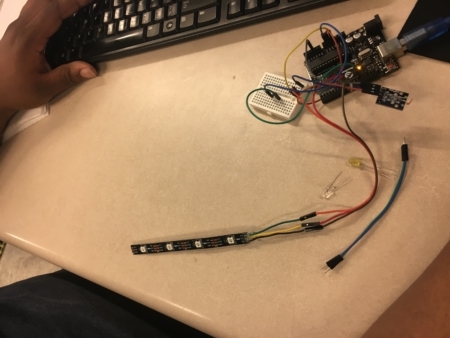 When I came to lab after spring break, I forgot how to connect the Arduino and light the LED. I followed steps explained in Arduino Introduction tutorial. I successfully light up the white LED. Then, I started to connect the digital temperature sensor. To find the sample coding, I should know the name of the sensor. However, the specific name of the digital temperature sensor was not googled. TA helped me with searching the name of the sensor but she could not find it. I decided to change the digital sensor to 18b20 temperature sensor. 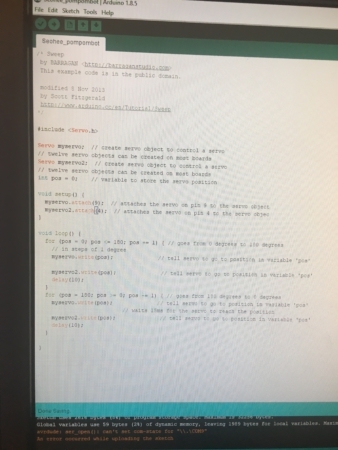 My classmate helped me with doing this assignment. When I changed the digital temperature sensor to 18b20 temperature sensor, the 18b20 temperature sensor was not working. When I runned the first codding, there was an error. The error said something about “include”. My classmate told me that the computer is stupid that we should tell the word we command to it. So, I downloaded the jip that introduces what “onewire” means. The next error was something about the com6. I plugged the port to com4 so it did not work. Finally the computer was connected to the sensor. However, the sensor printed out wrong number: it said the room temperature is -127 celsius. At the first time, I thought there was problem with coding. However, TA told me that the sensor did not have any problem. Then, I checked my pin-socket jumper wire. The first one is signal second one is power but I switched two so it did not work. Finally it printed out normal temperature. The next step I do is making the light up when the room temperature is hot. First I made the computer to say “Too Hot!” when the temperature is above 30 by writing at serial print. Then I had the light up the LED using “if” code. What I thought after finishing the assignment was that I need more basic knowledge of coding. I even do not know how the coding process is working. It would be better when I know much information. If I had more time to work on the assignment, I might learn about coding and make more sophisticated and complicated output. 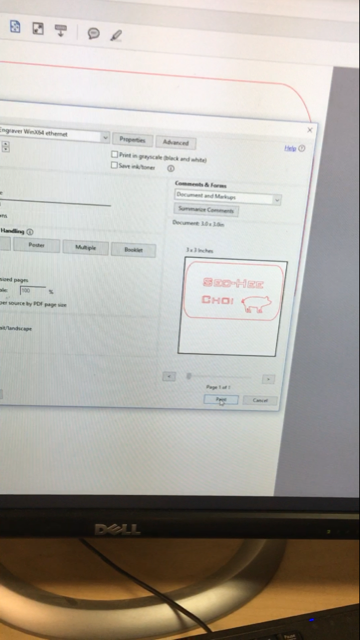 One of my classmate made a program that showing the heart popping up when the heart beats. Among all the other projects, Arduino assignment was the most difficult one that makes me realize my limitations. However, it was really funny and proud of myself when the program worked with my coding. I tested my sensor whether it works or not by touching the sensor. Because of my hand heat, the temperature became higher. 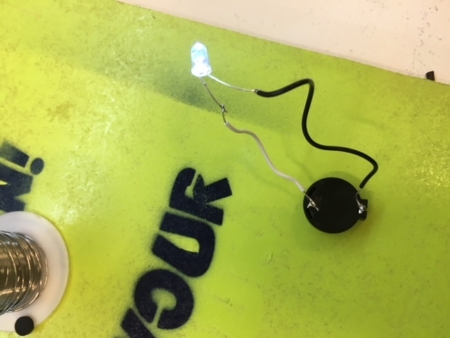 I saw Craft Magazine LED Embroidery (video) for basic knowledge of using conductive thread to light up LEDs. 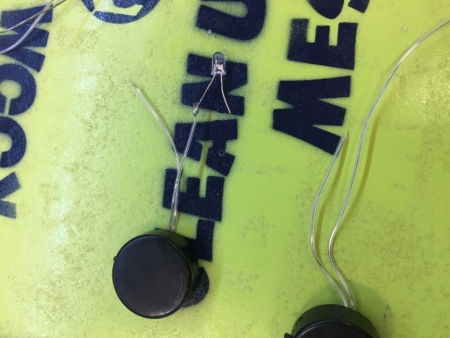 However, I wanted to see how to connect the conductive thread to successively light up the LEDs. I googled it. 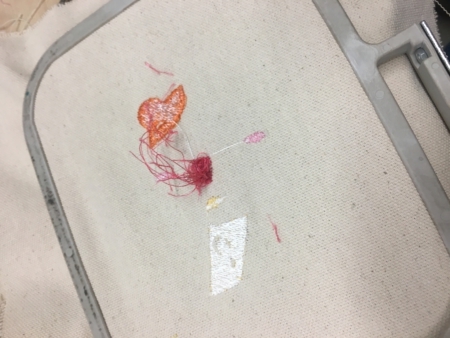 During the process of using sewing machine, I had many failures. If I had more time, I would use LED in my design. Except for the small part done by my hand sewing, I satisfied with my work! It takes more than 2 days to finish the assignment, I enjoyed the project. After I used sewing machine to print out the design in PEDesign 10 in class, I download the image and used it. 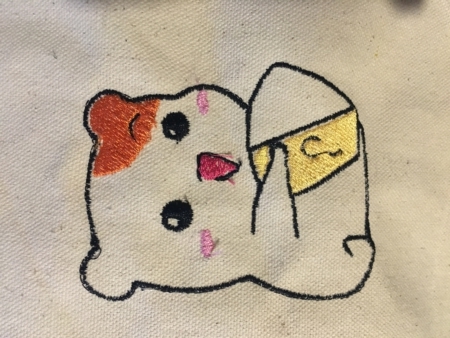 When I first tried this hamster, the thread was tangled underneath. 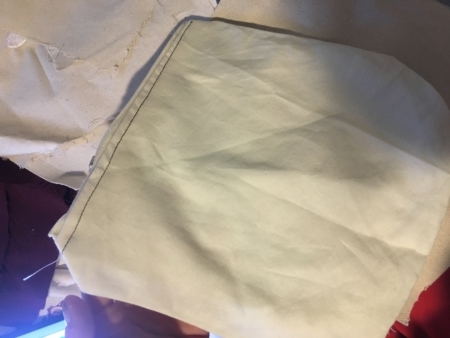 I made simple white pouch to put creepy and colorful design on it. What was the original Point of View (POV) that inspired your creation? 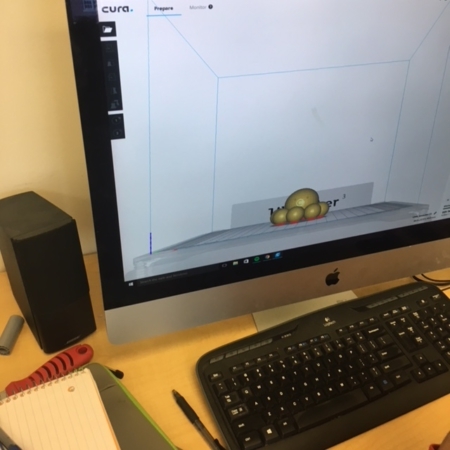 Think back to the activities we’ve done so far in class to frame your response – visits to the 3D scanning and printing labs on campus, the storyboarding exercise Jeff led or the readings on makerspaces. What problems does your creation help to solve or interpret? How might it address feelings or interests of users or viewers? I first went to Beckman Vislab and then makerlab. To me, makerlab is more inspired my creation. When I visited the Beckman Vislab, it was awesome but seemed like expert laboratory which is difficult to use. In makerlab in BIF, there are many 3D models. The TA told us the basic knowledge of 3D printing and what are they print out. There are tiny and cute models, and I decided to make a work of art with cute little mode. Also, the TA told us that they also make the phone case. I really wanted to work on making phone case because it would be one and only phone case in the world. In addition to learning how to operate the software what was something else you learned during the process? Use those reflection questions! In the first discussion session for 3D printing, I saw the red hand model which was an example of wrong model. However, I thought it was great idea of using hand shape for art work. It could be used as holding subjects and being an artwork itself. I changed the original design of praying hands. I tried to use 3d scanner and Sculptris. I thought there were enough knowledges and tools I needed for my goal. I was so excited to envision what I imagine and design. My original goal was to only scan my hands and revised it little with Scultris. However, it was difficult to scan only hands. 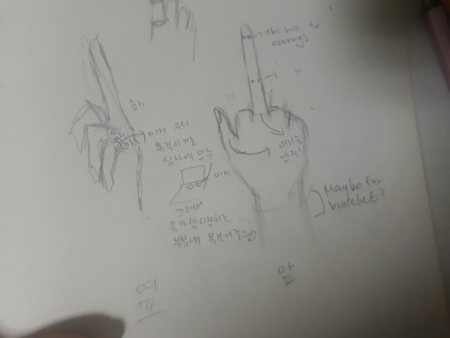 When I asked TA how to scan hands, he said it would difficult to scan it because hands are too small. Thinking for a while, TA and I got an idea of took a pose by praying hands, scanning the whole body and cutting all other body parts. 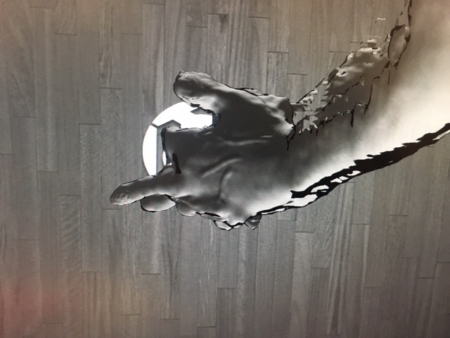 Unlike what I imagined, 3d scan of my hands are not clear and crushed. I tried three times to satisfy. Final scanning was not perfect enough. I have to use Scultris to reshape of my hands and draw the details of nails or bloodlines so that the model would more look like “hands”. My goal of this assignment’s prompt was to make a sculpture which makes people who watch it interesting. To be honest, my first goal was not achieved. When I print out the revised praying hands, it really messed up. 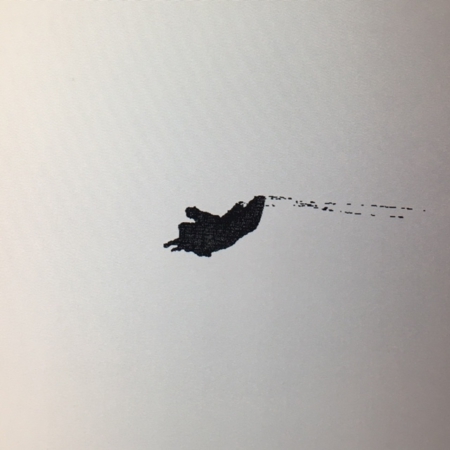 Unlike seen in the laptop screen, the printed 3d model of revised praying hands could not be identified as hands. The second work is quite clear and satisfied the goal. 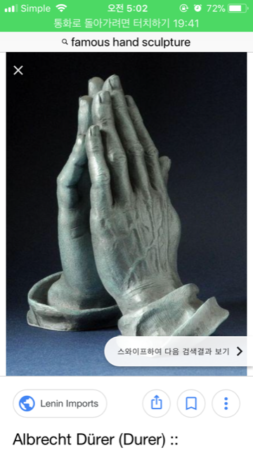 I could remove the support easily than the support in revised praying hand model. 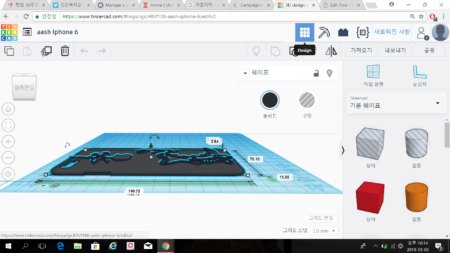 When I read the article about the limit of 3d printer-require much knowledge for complicated model-I thought I could do complicated model because I learned how to use the software. After finishing ths assignment, I realized that 3d printing requires more practice, skills and knowledge. Even though the final product did not met with original goal, I was proud of not giving up the process of scanning and revising praying hands. Since 3d printing was not familiar than other previous assignments, I got lots of help from TAs, google, and peers. Getting help could also improve my level. It was precious experience to print out my 3d model. What might you change about your design if you were to do another version? I want to change the size of the model. When I colored eyes of the octopus, I colored other part of its face. I printed the small size of octopus was because I thought it would be cuter than bigger size octopus. However, little more big size might be more perfect model which satisfied my goal. I was first inspired by this sculpture. Then I decided to revise the design of it. (1) a sketch or storyboard: This is my first draft of designing 3d model of revised praying hand. 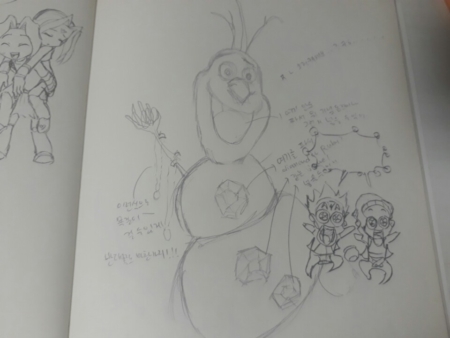 Right photo is the sketch of olaf. For Olafee, I used the other user’s format and changed Olaf to Olafee giving eyelash and flower on her head. For iPhone case, design what I want for my own phone case. 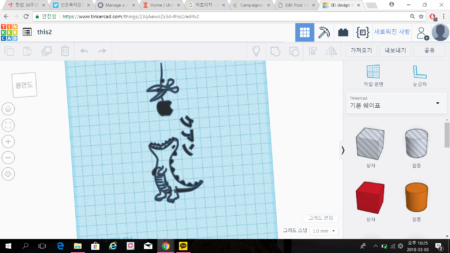 I wanted to print out the snow white image, so I googled how to insert the image in the TinkerCAD. 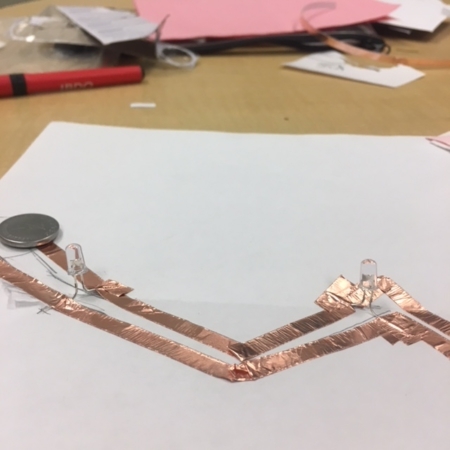 The third project is to make the copper tape 3d card. My lab section is 2/13 and the next day is the valentine day. 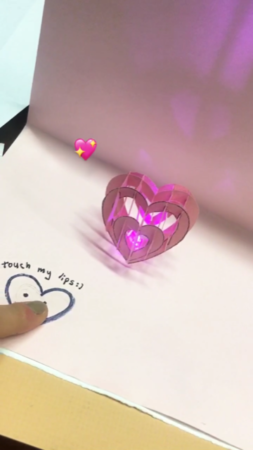 I wanted to make a 3d pop-up card for valentine day that I could give to my boyfriend. The topic of my copper 3d card is love and heart. Instead of just making 3d card by cutting the background paper and sticking the 2d picture, I wanted to make a 3d card by sticking the 3 dimension paper on the card. I have all the tools that I need to make 3d card. I wanted to use pink light and green lights and there were these color-light bulb. I have the knowledge of the circuit. However, It was quite difficult to design the new circuit for my own card. I was so excited to make it. I often make the card for my family or friend’s birthday. I think it is really cool because I could use the light. One thing I worried about was that if the circuit does not work. Since the 3d heart might take a long time to make it, I would be depressed when I have to make 3d heart again because of all settings for circuit do not work after I stick all together. I saw multiple LEDs parallel circuit video to make sure I am doing in the right direction. This video might help other peers to design their own circuits. Since my card tried to avoid displaying the copper tape at the outside, I should check before I stick the two layers of paper. If you do not check whether the light turns on before sticking the two papers, you should start all over again. 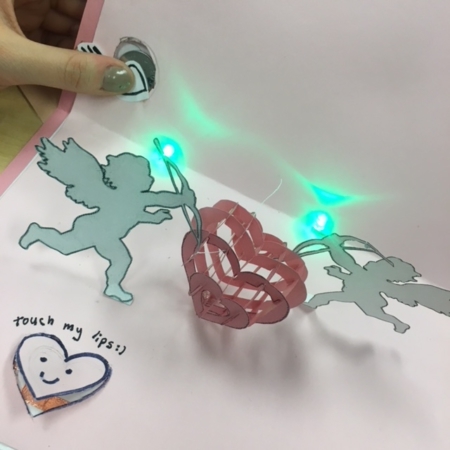 Instead of put the LEDs on the background page, I put my LED and circuit on the bottom and made a hole for LED; so that other people could only see the LED lights shining right below the 3d heart. I also put two green LEDs in the corner so that it seems like there is a light from the cupid’s arrow. One thing I should be carefully when I work on green LEDs is that I should make the top layer not touch the part of circuit. For the green LEDs, I used parallel for making the light as bright as only one LED. As I mentioned above, I usually do stuff like this at home. It was worthy of making my own card to precious people because it seems more heartfelt gift. I think I need to be more flexible to design the multiple LEDs circuit. I separate the two buttons for two LEDS to turn on. If I had more time, I would make more fancy design card. Since I had so many works this week, I could not fully engage in the copper card making. For this assignment, I do it all by myself. I am proud of myself:) I decided to finish my project because of the time. 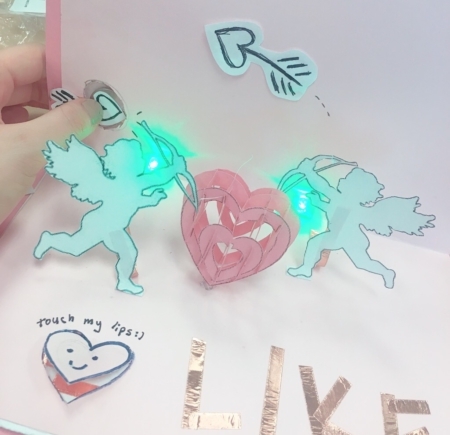 My goal was to make 3d cards with three LEDs and the design of cupid and heart. My final product my goal and I am satisfy with the card design. My card works for all three LEDs. 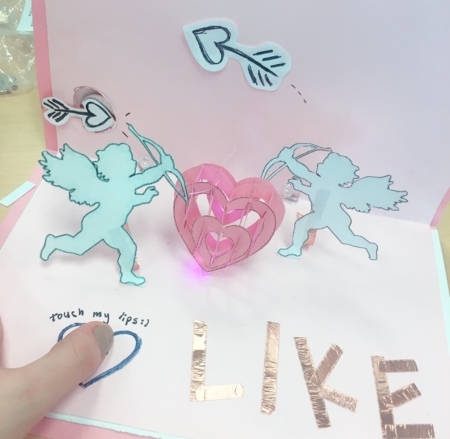 One thing I had a change in my final product is that I added “LIKE” with the copper tape for design and also added the heart arrow in the background. Describe a “big moment” that moved your project forward. At Sunday dinner, I was doubted I could finish this project with my goal met. It was so difficult to make 3d heart and make it stand. Also, I took long time to consider the design of the multiple LEDs circuit. After I finished making the 3d heart, then I started to make the 3d card delightly having the self-confidence. Unlike the previous assignments, this project took more time. I was often frustrated to make the 3d heart and struggle with not-working-LEDS. Sticking small parts of heart and arrow together was so frustrated because of my shaking hands. Although, it was tough time to finish in a week, all the process was fun. I have a fun time because I made what I want to make. These are photos of final product. The second assignment for Info490 is making stickers with Inkscape, Silhouette Studio, and silhouette machine. I was so excited to work on this project. It was fascinating to make my own stickers which are more applicable than the name tag. 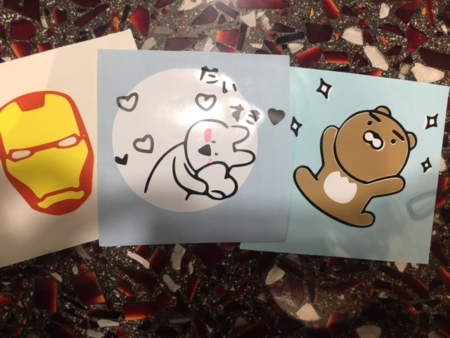 I wanted to make stickers to put on my lap-top, iPhone, and notebook. In the lab section, we first learned how to make griffin. Then we learned how to make multi-layered stickers. The principle of making multi-layered sticker is similar to the multi-layered name tag which I made for the first assignment. For the multi-layered stickers, I wanted to make the animation character which has some colors. 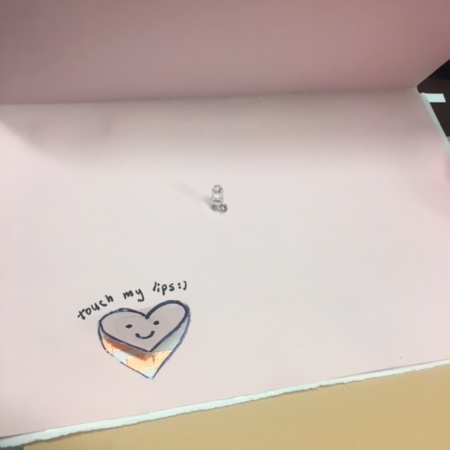 When I saw square stickers in the box, I thought that I could not perfectly make a sticker that I wanted because there are not many colors. However, full knowledge and basic colors of stickers was ready. One thing I worried about was that if the design is complicated, it might be difficult to make delicate and neat sticker. Showing how to edit the design would help me explain the process of making stickers to a peer. If you know how to make the machine read the design, it is easy for the peer to learn it. What I thought during the process of making my stickers, it was hard to separate tiny parts. 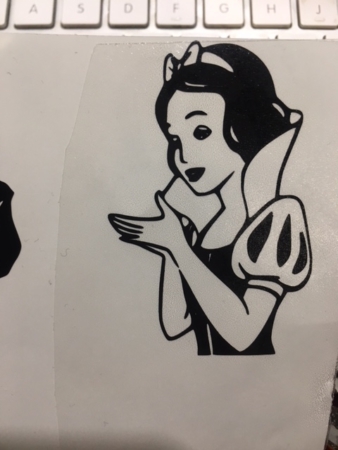 When I was making the Snow White sticker, it took more than 20 minutes to separate all the small pieces. 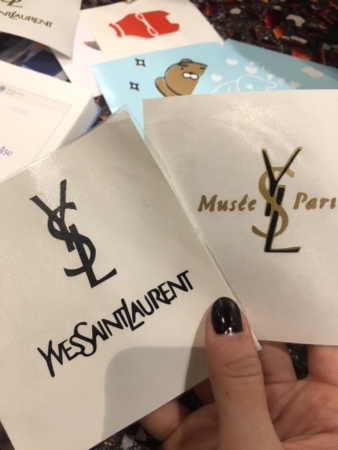 So, if you want to make the sticker which has complicated parts in the middle of it, you can make the sticker size bigger, or just avoid such design. I usually do not do the stuff like this at home because I do not have tools like tweezer that allows me to do sophisticated work. I wanted to learn how to use the Photoshop program. One of my peer use Photoshop for making more sophisticated design. If I had more time, I would have red color in the hair band for the Snow White stickers. For this assignment I did not inspired by others’ idea since I had been thought of making my own stickers. The mistake I made was that when I worked with the rabbit character with Japanese words, I stick the black layers little bit outside of the white circle. Once the black part sticked with the white circle, it was difficult to separate. However, that mistake now seems like unique style. It was so precious time for me to make the stickers. I really enjoyed the project. It is always happy and funny to make what I really want to make. I first used black logo, then I used gold and black. 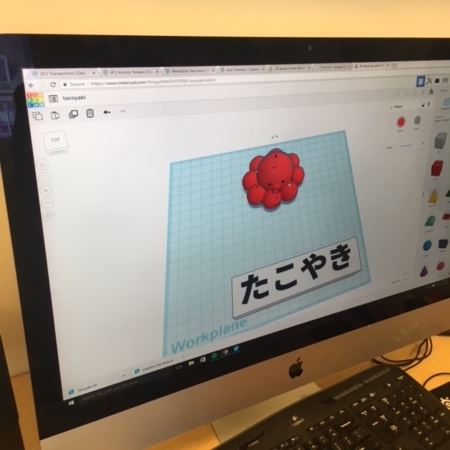 Our first project in Makerspace B is to create a name tag with laser cutter. During two hours of discussion section, I was so excited. It is kind of amazing stuff to print out one dimension image to a two dimension name tag. When I first saw the nametags that TAs made, I thought I want to make a simple name tag with unique style. The one that captured my interest was the name tag with two layers. 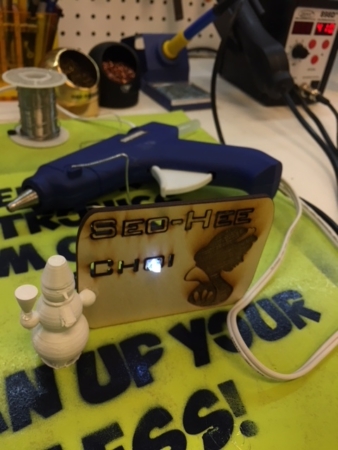 Since I cannot color the name tag with laser cutter, it would be better to have different layers with different color to make the name tag more colorful. I planned to make a two-layered acrylic name tag which is more sturdy than the wood name tag. I fully understood the way to design and set the name tag design and had two acrylic materials. After attending at the discussion session and taking the video of the whole process of the project, I could briefly help the other students in Makerspace class. When I made a second name tag which is final product for this project, I used the mirror-like acrylic and black acrylic. Unlike the wood material, there are only few part of mirror-like acrylic that I could use. Since I have to limitation in using small portion of the material, I should carefully use the material; no mistake accepted. I sometimes do the stuff like this when I have to build up for my convenience. For example, I made the crosspiece for iPhone with used-up foundation bottle when I had to watch the movie with phone. Since the mirror-like acrylic has small portion, I had to start the laser point from the middle part. 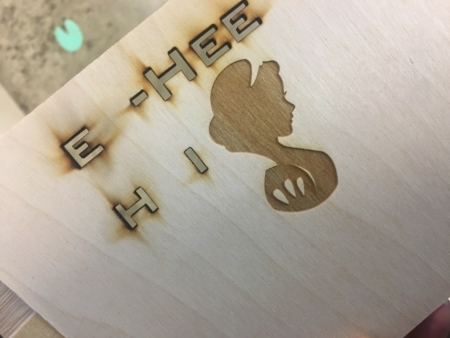 I thought I have basic knowledge of using laser cutter to envision what I imagine for the name tag. If I want to make more complicated name tag, then I should be more comfortable with using Inkscape. 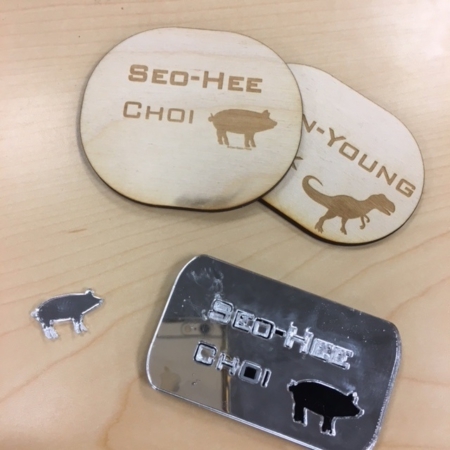 However, for me, making name tag with a laser cutter and Inkscape was quite simple; red part cut off and black part sculpt. Also, I could have colorful name tag using different color materials. If I had more time and more material that I could use, I want to change the size of the name tag to 4 in x 4 in. I first decided to make my name tag with simple name and my favorite animal. One of the example name tags that my TA showed us in the class finalized my final design of the name tag: two-layered name tag with simple design. When I finished the project and made one more name tag for reminding what I done, I helped my friend making her own name tag. She made the name tag with wood material. Her name tag had a shape of Bay Leaf. Before seeing her name tag, I thought the wood name tag is too simple. However, her name tag design made me realize that the texture of material could be strengthen the design. Her Bay Leaf-designed name tag would be less impressive if she made it with black acrylic. TA in the Fab lab helped me when I was using the laser cutter. 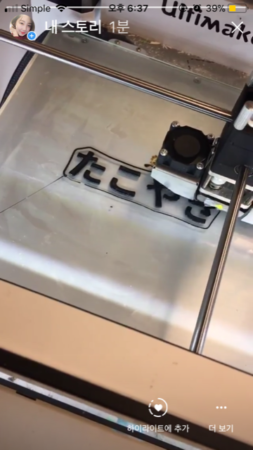 Since I already took the video of the laser cutting process, I do not need much help. I just asked TA for checking whether my setting do not have any problems. My final product was quite satisfied, so I decided to finish my project. One mistake that I made was that I did not perfectly estimate the real size of the name tag. I wanted to cut off the whole letters of my name, but the letters was too small to cut all lines of the letters. What I did was I just cut off the “o” letter and let other letters stick in the first layer. My perfect goal was to cut all letters and pig silhouette off so that letters seem black and other background is mirror. 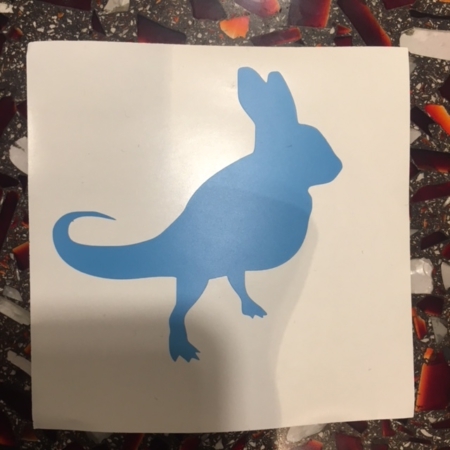 Because of the small size, I just had to only cut off the animal silhouette. Only pig silhouette was fallen. When I tried to separate the letters, the whole part of letters fell, and it was difficult to see the exact shape of the alphabet. So I just sticked the letters back. One that I did not expect was that the glue was so sticky that when I stick back the alphabet “s”, residue of glue made the surface of name tag dirty. Second unexpected thing was the size of the letter as I mentioned above. I thought my project moved forward when I created my name tag by myself. Without the lead of the TA, I had to envision and create the name tag as I imagined. I was really proud of myself when I finished the design and print it out. The whole process of making the name tag was so interesting and funny that I did not even think of doubting me and giving up. Simple and Fun activity. The only frustrating thing was glue that made my name tag dirty. The final name tag for this assignment is the mirror name tag. 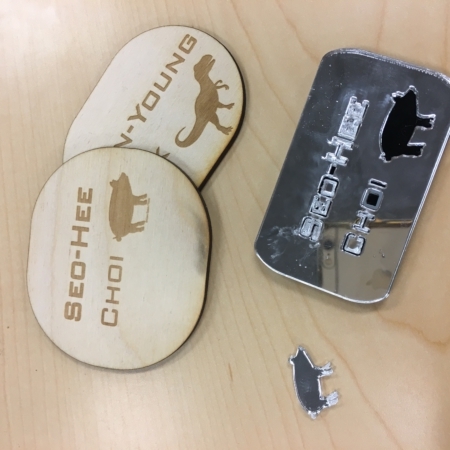 “Seo-Hee Choi” name tag with pig is the name tag that I made in the discussion session and the name tag with dinosaur is I made after finishing my final name tag.